Me in the 5th grade. By the time this picture was taken, you could describe me as a hopeless monster movie nerd. 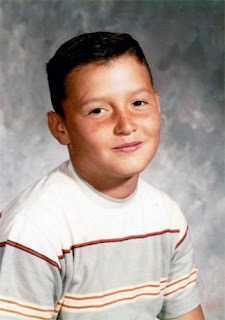 I was attending St. Catherine's of Sienna in Martinez California and had been since the first grade. How much of a movie monster nerd was I then? When it came time to pick a patron Saint for my Confirmation? (A ceremony for Catholic teens that is a follow up to Baptism) I chose Saint Quentin, but not for his history as a man of God, or even the fact that he was a Saint at all. I chose Quentin because it was the name of the werewolf on Dark Shadows. 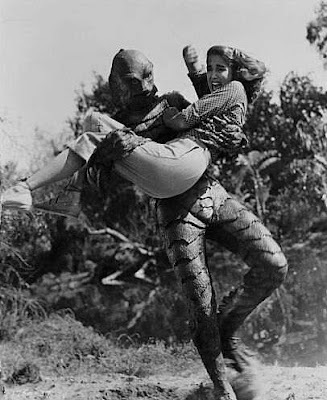 (a publicity still from the 2nd film in the series, REVENGE OF THE CREATURE) where the Gilman was leaping out of the water. The caption read "ALRIGHT, WHO PEED IN THE POOL?" I would have preferred no caption at all. 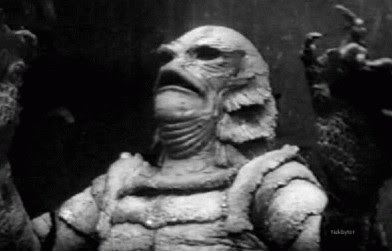 I didn't like anyone making light of the Gillman! It hung on my wall because it was the only actual poster of the creature I had ever seen. I shared a bedroom with my brother, a year younger than me, and we decorated it with just about every Aurora monster model there was back in the early sixties. 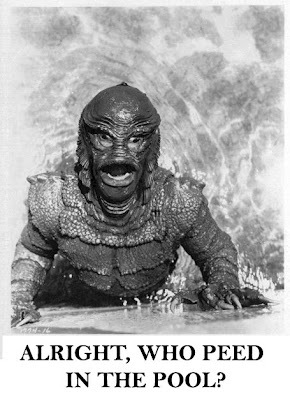 We had THE MUMMY, THE WOLFMAN, GODZILLA, FRANKENSTIEN, DRACULA, THE PHANTOM OF THE OPERA and one called THE FORGOTTEN PRISONER (basically a skeleton hanging in shackles in someone's dungeon) and my all time favorite, THE CREATURE FROM THE BLACK LAGOON. This impressive collection of creatures, lining the top of a bookcase that ran the entire length of our bedroom, even had some that glowed in the dark. But even when the bedroom lights were out, this horrible parade of resin nightmares were never a source of fear. Not to me or my brother. I actually think we felt more like they were our friends and protectors. There were monsters in our room and on our walls. And we understood them. Much better than we did the world around us and especially our volatile, hard drinking mom and dad whose behaviors and habits made our home a house of fear. 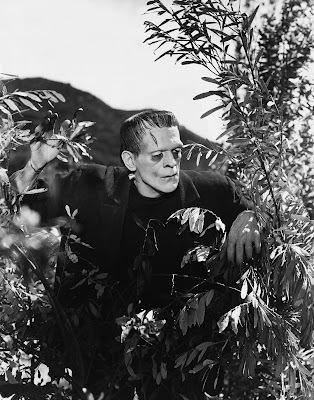 taken the time to watch the original Frankenstein films with Karloff, realizes that the monster was just an innocent. A child himself really. One who did not choose to be born into the brutal world he woke up in. Reviled and brutalized by the ignorant and the frightened people who feared him. Lawrence Talbot, who while attempting to rescue someone being attacked by a vicious animal, is bitten and inherits the curse of being a werewolf. Taken over by an animal side of him that he has no control over. And all as a result of a single act of decency. 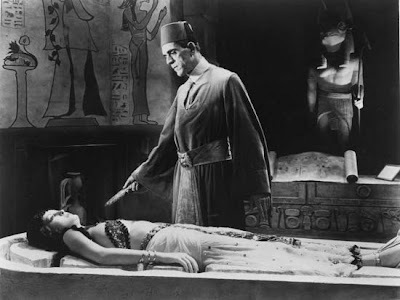 Or the Mummy, who as a man, fell in love with the wrong woman, and so was tortured and then entombed alive, before waking centuries later, lonely and searching for the reincarnation of his lady love. 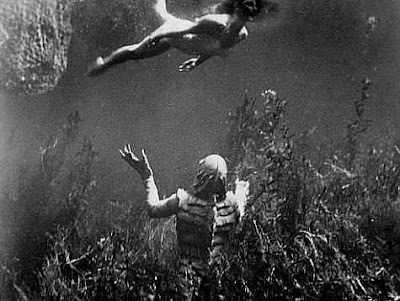 Or my all time favorite, The Creature from the Black Lagoon. His home was invaded --make that polluted and violated-- by men of science. His great sin was curiosity. He saw something beautiful in the water. Something lovely that he had never seen before and he went after it. However misguided the Creature's feelings were, and even with the sexual connotations aside, there was no boy of any age watching this movie who didn't understand how the Creature felt --about having his world plundered by the tyranny of men who were stronger and in greater numbers, or wanting something desperately that he couldn't have. Again, here was a creature who never exhibited any violence at all, until he was himself assaulted, by men with guns and poison, with an agenda to tear him out of his world, and dead or alive, drag him into their own. These creatures had a human aspect that each of us feel, as we navigate our childhood. There was a morality in these movie monsters that invoked a deep sense of empathy. These monsters were victims first. And monsters second. These creatures, immortalized in resin and Testor's model paint, were not just indications of our youthful obsession with the macabre or the gruesome. and fought about the order they should be displayed in. This may have been because we were used to being victimized by scary, violent and unpredictable presences in our lives and the monsters from the movies were the only ones we could control. I've been through a decade or so of therapy and the smartest ones always had a theory that the reason horror films are so popular is that they are a healthy way to experience our fears and the darkest corners of our repressed psyches in a safe environment. Maybe my brother and I bonded with the creatures from the movies the way hostages sometimes start to bond with their captors, I don't know. In looking back, it feels more like these monsters in plastic watched over my brother and I, while we played and slept in a house of fear. Fear that had nothing to do with our monster friends. They were like gargoyles. Gruesome looking, but designed that way so they would scare off evil spirits and protect us from the bad things all around us that we had no control over and no protection from.